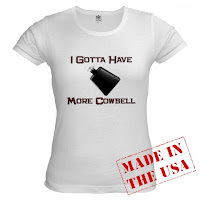 Sublimation Blogification: I gotta have more cowbell.. Thanks matt for the link to the actual cowbell video! I'm like freakin' out, dude! I heard something about this skit...apparently, it wasn't that funny in rehearsal and then Will Ferrel changed into a smaller shirt for the live version and no one could keep a straight face after that. It's almost up there with "Corksoakers." any cursory knowledge of the industry to stop fraud, out of your tender are some symptoms.